My Mum barely trusts me with a bread knife, so the look on her face when our tour guide handed me a huge sword was priceless. When I went to Dublin a couple of years ago, I went on a Game of Thrones tour and loved it. My Mum was very envious and when we heard that the same company were running two different tours from Belfast we booked flights straight away. 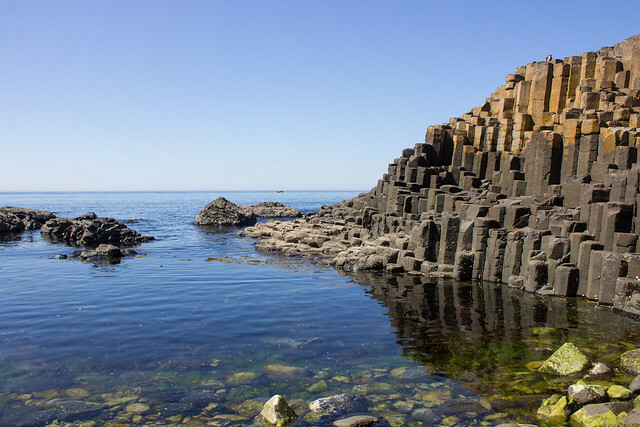 The first tour we did was called the Iron Islands & Stormlands Adventure tour, which they started running earlier this year, which also included a trip to the Giant’s Causeway. 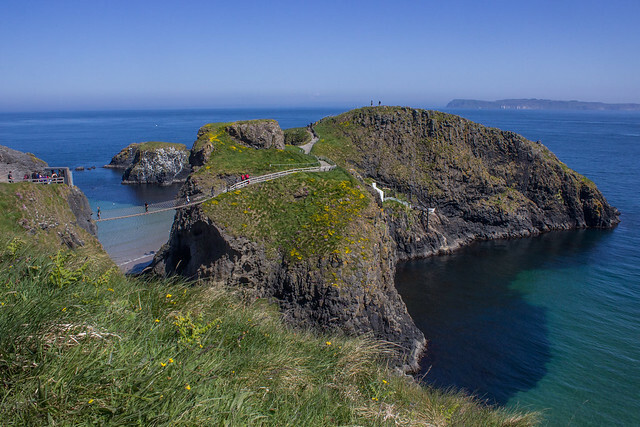 I knew that Northern Ireland was stunning and I knew how good the tour would be from my previous experience, but my expectations of this tour were absolutely smashed. It’s genuinely one of the best things I’ve ever done; right up there with kayaking in Stockholm. Stop one on the tour is Cushenden Caves, where Melisandre gives birth to the shadow baby. The cave itself is a pretty small, dark, dingy cave (y’know, as caves tend to be) but when you’re stood outside it surrounded by the beautiful scenary and it’s 20-odd degrees, you find it hard to imagine it’s the same dark and horrible looking place you saw on TV. 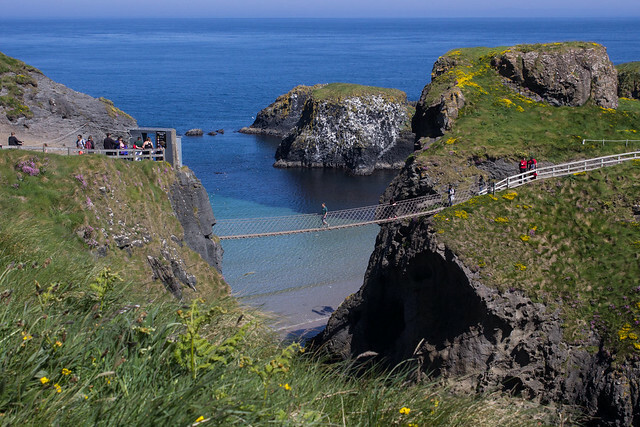 The 30m high bridge leads to a small island, offering stunning views of the coastline. I was a little blown away by how clear and blue the sea was here. 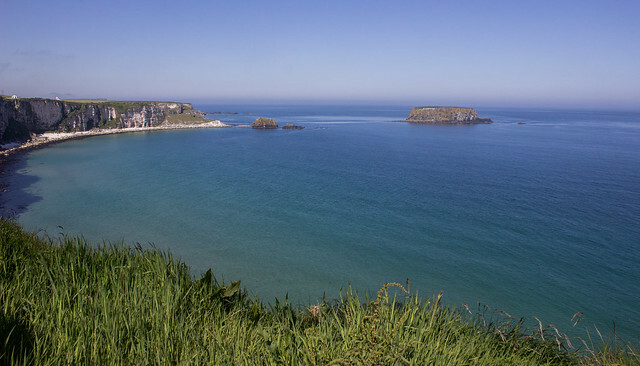 When you think about the sea in the UK you probably think about dark bluey-greeny sea (or maybe brown if you’re thinking about Blackpool…); you probably don’t picture sea so beautiful it looks like it belongs on the front of a Thomas Cook brochure. 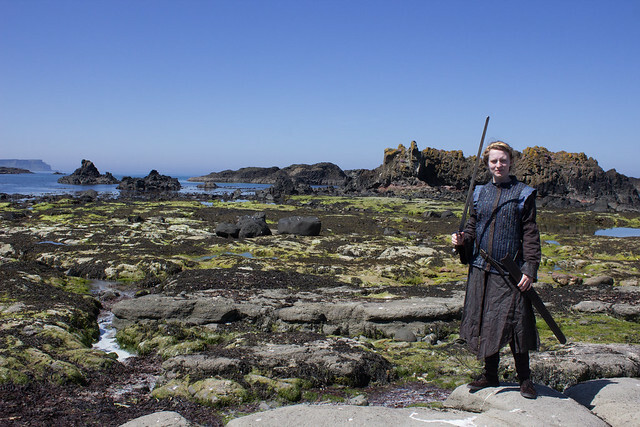 After lunch, it was time to head to the “iron islands”, which was the part of the trip I was looking forward to the most because I love Theon’s storyline, and I got so excited watching it all kick off in the last season. Plus, doesn’t the scenary just look stunning? 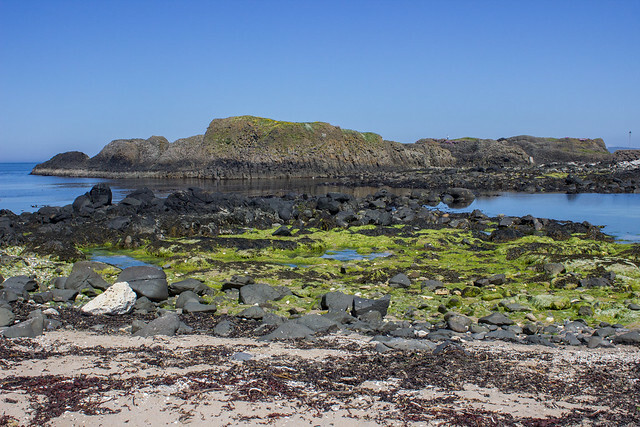 Different parts of Ballintoy Harbour, which is easily one of the most beautiful places I’ve ever been, have been used throughout the series, and it’s easy to see why. It’s beautiful, but it also looks quite desolate and harsh, which is exactly what the iron islands are supposed to look like. 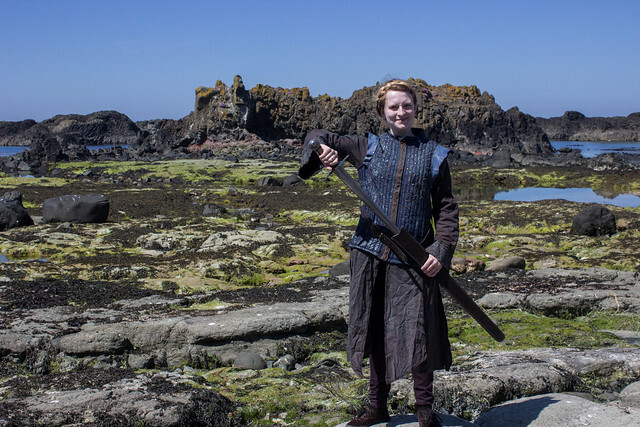 Of course, it doesn’t look immensely harsh and desolate when the sky is perfectly blue and you’re prancing around dressed up like Yara, waving a sword about, much to the confusion of strangers trying to enjoy a day at the seaside. Our guide told us that when they first started running this tour, and people were running about in Game of Thrones costumes, people thought they were filming for the series and were asking people for autographs. 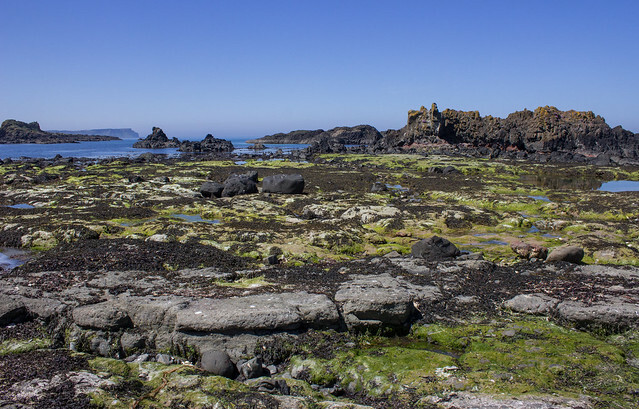 There was a brilliant moment, where we walked across a sandy beach, all geared up like Iron Islanders, and a sunbathing family looked at us in a mixture of absolute horror and confusion about what was going on. 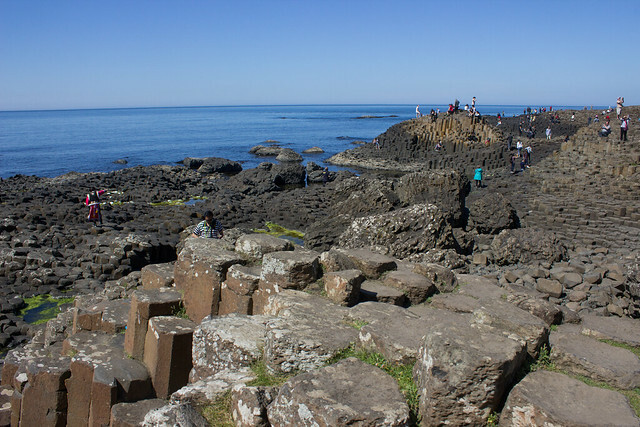 Once I’d sufficiently sweat in costume and almost impaled myself and smashed my camera, we were back in the bus and headed to the Giant’s Causeway. This is one of those places that I’ve wanted to see since I first became aware of it and I was so happy when I read that it was part of the tour. Unfortunately, I found it quite underwhelming. We couldn’t have wished for better weather, and maybe that’s what spoiled it because the place was absolutely packed, and I wonder if that’s what ruined it for me. There were people perched everywhere, a sea of selfie sticks and the now unfortunately far too commonly seen tourists taking photos on their iPad (it’s an irrational annoyance of mine, that). It doesn’t actually look that busy on the photo above, but it was and I think that ruined it for me. I felt the same way about Stonehenge; something that’s so legendary and spectacular is ruined and hard to appreciate when it feels like a tourist trap. The Giant’s Causeway is fascinating and it’s set in a beautiful place but I got back on the bus feeling disappointed in it and was glad we didn’t stay there long. After a quick stop off at the side of the road by Dunluce Castle, which the Greyjoy’s seat of power in Pyke is based on, we headed off to take a photo of the iconic dark hedges, which is the road Arya and Gendry escape down. Yet again, the location doesn’t look anywhere near as moody as it does in the show thanks to the glorious weather, but it’s hard to imagine this place not looking beautiful in any kind of weather. 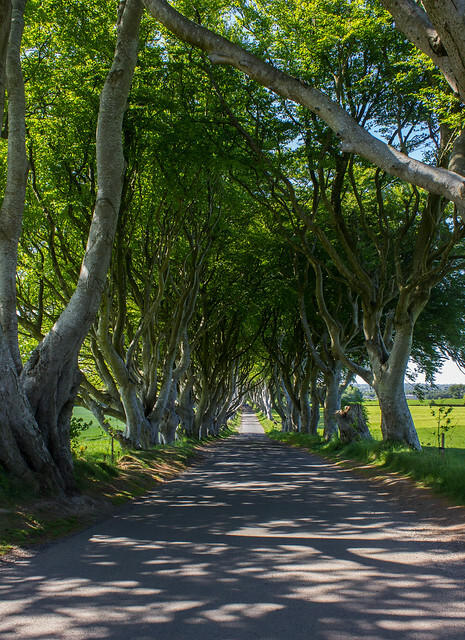 Some of the trees fell in winter storms earlier in the year and they were taken and turned into 10 beautiful doors which were placed in pubs around Northern Ireland which had some kind of connection to the series. 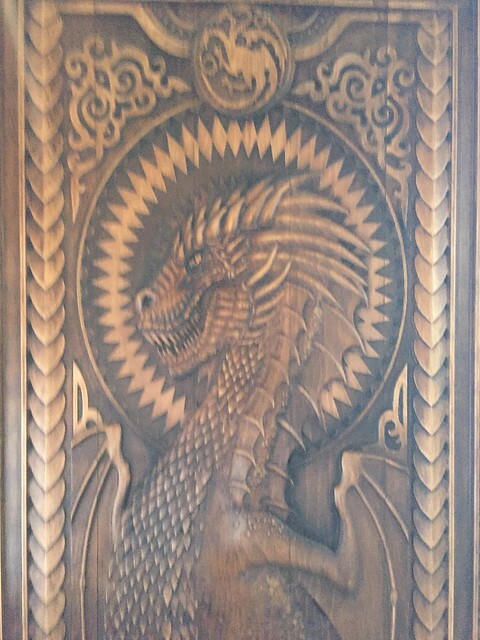 One of the doors was in the pub we stopped off at for lunch, The Cuan, and it’s a stunning piece of work. My photo does not do it justice at all, so you can find a better one here if you scroll down to door 6. 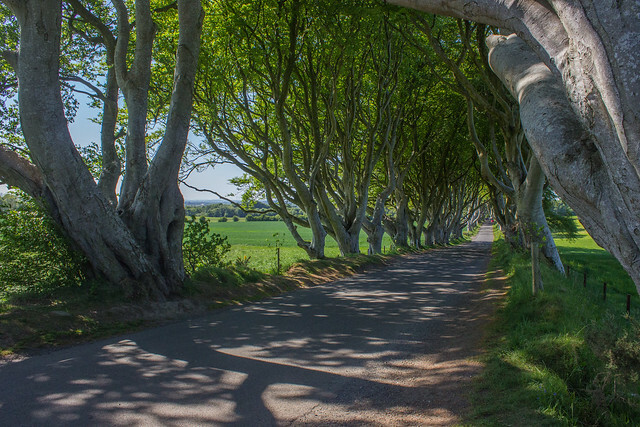 If you love Game of Thrones and are planning to visit Northern Ireland, I honestly cannot recommend Game of Thrones Tours enough. Their guides are amazing; full of knowledge about the show and the two we had were both extras on the show, so they’d got some great stories about their experiences on set and how the series is filmed. It’s one of the best experiences I’ve ever had, and it felt so immersive when were all kitted out as iron islanders, flailing swords about. I’m pretty sure my Mum and I are now going to choose holiday locations based on whether or not we can go on a Game of Thrones filming tour; we are doing Iceland together next and they did film in Iceland also, so I think we’re doing pretty good so far. Have you ever been to any filming locations?